On this date in 1307, radical preacher Fra Dolcino was gruesomely put to death in a daylong public torture at the Piedmontese town of Vercelli. Dolcino was the millenarian successor of Gerard Segarelli, whose itinerant commune of impoverished penitents — Apostles, they called themselves, to the chagrin of the Church hierarchy — had attracted followers for near half a century before the powers that be smashed it. The shade of the burned firebrand (and the corporeality of his refugee onetime followers) haunt the murderous monastery of Umberto Eco’s The Name of the Rose. Here, the paternal Franciscan unraveling the novel’s mystery explains Fra Dolcino’s illicit movement to his naive protege. From the cinematic adaptation of The Name of the Rose. 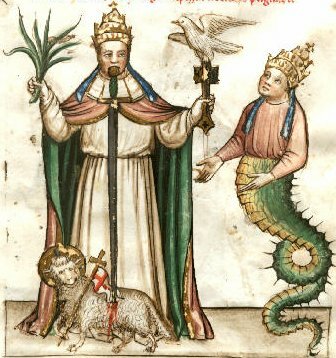 The monk’s semi-coherent summons to “penitenziagite” is significant because it marks him as a former adherent of the penance-focused movement. An Italian metal band called Dolcinian had a song (and album) of that exact title. But were they really an “armed band”? Executed Today is pleased to mark this portentous anniversary in conversation with historian Dr. Jerry Pierce, currently working on a book about the outlaw movement. 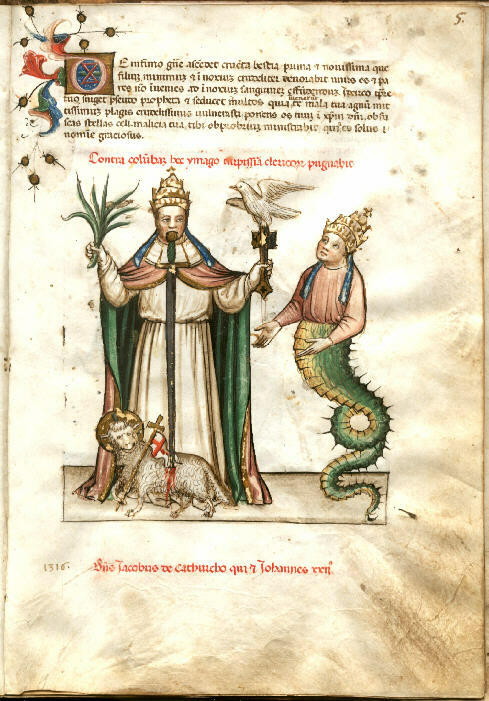 ET: Who were the Dolcinians? JP: A lot of people get kind of caught up in the Dolcino part. It’s not about him until the very end. The group itself originated in 1260, and it lasted 40-some years before it ran into any trouble. Their whole goal when they start is essentially, live a life of poverty like the original Apostles. And apparently that’s a problem for people later. That’s really all it was about. It’s communal living, it’s not owning things at all, including houses. By 1260, they were better Franciscans than the Franciscans were. 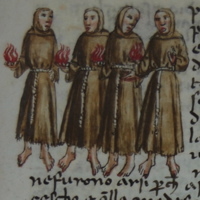 And the Franciscans had a big presence in the city of Parma, where this thing got started, so they were slightly peeved. So it’s a challenge to the Franciscans? It’s not trying to show up the Franciscans, but it becomes a challenge. The “Apostles” wander around, they beg for their food, they tell people to do penance. The early Franciscans started off the same way, all about poverty, but once they became established, the order became all about money. And the Apostles are not the only ones mounting this challenge. Right. Waldensians in France predate the Franciscans by about 30 years or so. * You just have a guy in France who’s a businessman who hears a reading of the gospel saying to give up your possessions and follow Christ. And that’s what he does. He even pays someone to translate the Bible into vernacular French, which is a big no-no. His group and Segarelli’s group are not an issue as long as they don’t say anything about the doctrine. So long as they don’t say anything about the Trinity or the Eucharist, they’re just calling people to penance — they’re okay. But the reason these groups come along is that in that period, around 1150 — Europe is experiencing a big economic change. The haves are on the side of the church. This is the core of all of them, and it’s the core of the Dolcino philosophy as well — the church is preaching poverty, but it’s living wealthy. So they were doing something within the practice of the Church’s community for decades. How did they get so dangerously on the outs? But what happens is they become really, really popular, and people start following them, and the Franciscans get the hierarchy involved. There’s nothing doctrinal about them until Dolcino that becomes heresy. And what specifically is that? You take Segarelli’s stuff about poverty and radical egalitarianism, and you have Dolcino either witness or know about the execution of Segarelli, and that sort of crystallizes for him that members of the Church are forces of evil. Basically, Dolcino says that if they would kill this guy for preaching nothing other than poverty, which is their own message, then there’s something wrong. 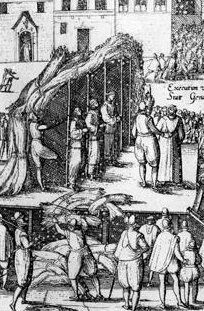 Because of the persecution — Segarelli’s execution, the Inquisition moving in and questioning people — that kind of pressure is what spurs Dolcino to take off to the northern mountains. That’s sort of the catalyst for him to become apocalyptic. But even suppressing that takes the Church years. The chronology is muddy because we only have about three sources, but we think he joined the order before Segarelli was executed. And between 1300 and 1302 or 1303, he’s off in the northeast of Italy near Trento. He’s from Valsesia, a river valley in the Piedmont, and he eventually returns with a bunch of followers across the mountains — between Novara and Vercelli. It’s an important area because the bishops of the two cities have been fighting each other for access to the valleys, and fighting the local feudal lords, the Biandrate. This family that’s been controlling the region, they’ve been extending their influence far up the river valley and the farther you go up the valley, the more independent the people are up there; they hate people who encroach on their autonomy and they’ve recently rebelled and kicked them out. And that’s the rebellion that takes place, it’s these farmers and families who live up there against the Crusader army. The Pope† allowed a papal indulgence for people going on Crusade up there. They essentially recruit a mercenary army. You have these non-Valsesian Crusaders and mercenaries who sort of move into these territories and basically get beat by the locals several times. We know there was this final pitched battle. The Dolcinians flee to a mountaintop awaiting the End Times. Essentially what the Crusader army did was they starved them into submission, basically just blockaded the whole area, and then overran a bunch of starving women and children. 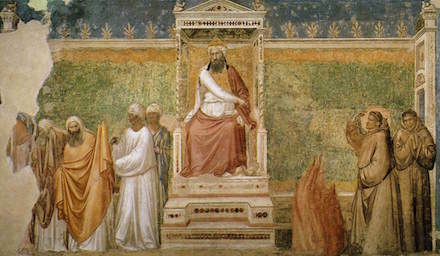 Dolcino also had a female opposite number, and the sect preached egalitarianism. Did they have an egalitarian gender politics as well? As to gender generally, the sources will say, these Apostles believed that nobody should own any property so they shared all their things and even their women. So you’re meant to think that they just pass them around, but that wasn’t the case at all; there weren’t orgies and such. In this case, they did stress radical egalitarianism. This is actually the ideology of the Christians in the first century: they also say, the world we live in is wrong, and it’s about to end — one of the things about the world they live in is, it’s patriarchal, and they come up with radical egalitarianism because there’s not supposed to be any distinctions in heaven and they’re looking forward to that. What’s the legacy of this whole movement? In its own time, there were remnants of the Order of the Apostles still in Parma and the area for the next 20 or 30 years. It’s not heresy to be part of the group per se. There are references to sort of straggler parts of the group in France, in Spain, for the next 100 to 200 years, but it’s really hard to tell. We do know they spread out pretty far. At one point under Segarelli they sent people to Jerusalem. The people who live in Valsesia still today totally revere Dolcino. You can go on Dolcino hiking tours! And there’s been this long history of appropriating his meaning. In 1407, members of the Church went out and built a church consecrated to the fight aganist the heretics near the site where the Dolcinians were wiped out, and the local populace was outraged. In 1907, Dolcino was appropriated by the Italian socialists. There was a workers’ group that planted a big red flag, and then they built a monument to him, with a plaque on it with the lines from Dante‘s Inferno. There’s pictures of this monument, with tons of people up on the mountainside and they’re all dressed in their best. 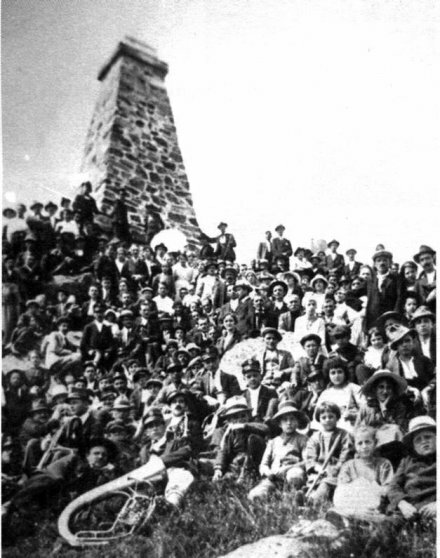 And the monument lasted until the mid-1920s when the fascists blew it up with pro-fascist clerics. It was rebuilt in 1974, and you can see the old Catholic church from it — two opposing claims on Fra Dolcino. Obviously you’re pretty sympathetic to this movement. What do you think we ought to make of them? I think for me the key to understanding the whole order is not just to say, “well, everyone understands it wrong.” There’s a sort of willful wrongness to it, that whenever you put apocalypticism in it, it immediately puts people in the crazy category. But in this period, when people talked about the end of the world, it didn’t necessarily mean they were nuts. And then the other thing is, they’re not as violent and threatening as they appear on first read. I’m not even sure that they ever lifted a finger against the Crusaders, they may have just fled. Which in a sense means that they hold true to their values to the end. More reading: A Historical Memoir of Fra Dolcino and His Times -ed. * The Waldensians hung around into the Protestant Reformation, and still exist today. ** e.g., about Segarelli, by a Franciscan — who calls them something that translates loosely to “ribald bumpkins”. † Pope Clement V: he would prove more effective crushing the Templars. 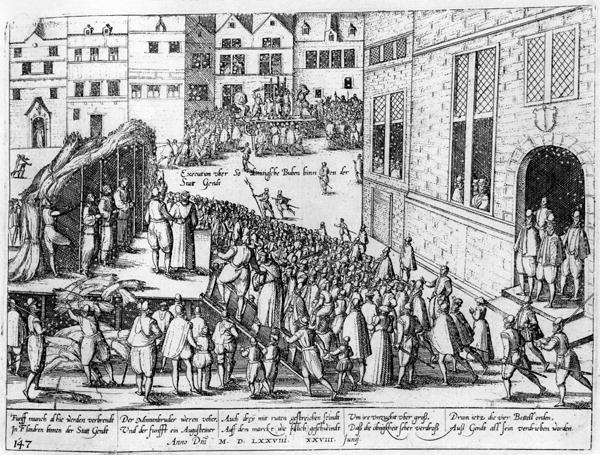 ‡ Margaret was also executed — allegedly turning down several smitten suitors’ offers to marry her if she would abjure. (Margaret was rich.) Although she’s most picturesquely shown burnt to death in front of Fra Dolcino during or before the latter’s torture, the sources seem to be unreliable as to whether she was in fact also executed on June 1, or on some other date.